There's never a dull moment on Wall Street, especially now when holiday shopping is under way. Let's go over some of the items that will help shape the week that lies ahead. 1. 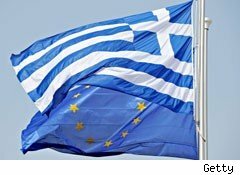 Greece Is the Word: Greek legislators will be in the news, as the troubled nation's parliament puts its 2012 budget to a vote on Wednesday. Yes, things are pretty bad in Greece. Bank lending activity continues to shrink and the economy is expected to contract by 5.5% for all of 2011. It's not just going to be a tense week in Greece. The European Central Bank and Bank of England have interest rate decisions to consider. Stock markets may have rallied last week on anticipation that everything will work out just fine, but it's not over until the sovereign debt crisis ends. 2. Right on Target: After clocking in with pathetic same-store sales growth of 0.9% last December, Target (TGT) doesn't want to make the same mistake this time around. The cheap chic department store operator is already trying to draw shoppers this season with a sale that offers a single toy at 30% to 50% off every day through Christmas Eve. This week it's going to give an "Almost Last Minute" sale a shot. Executives are telling the Chicago Tribune that the three-day sale -- running from Thursday through Saturday -- will feature a range of items including televisions, cameras, video games, and cookware. Almost Last Minute certainly doesn't have the same kind of ring as Black Friday or Cyber Monday, but it does relay a subtle urgency that should hit home with procrastinating gift givers this season. 3. For Whom the Bell Tolls: There may be no place like home, but there are certainly better places than homebuilder stocks these days. Prices continue to drop, and it's really anyone's guess as to when the industry will truly bottom out. Toll Brothers (TOL) reports Tuesday. Backed by one of the strongest balance sheets among real estate developers, Toll specializes in higher end housing. This has been a mixed blessing in recent years. Yes, the rich have generally held up better than the not so affluent since the housing market peaked four years ago, but the selling prices of the most expensive homes have fallen the hardest in terms of absolute dollars. Toll has actually made the most of the malaise. It turned heads last month after a timely acquisition marked its foray into the Seattle market. Unlike many of its peers, Toll is also finding ways to remain profitable in an environment where homes aren't selling all that quickly and contract cancellations continue even after some potential homebuyers sign on the dotted line. Toll's report will provide a solid glimpse into the company itself, but Executive Chairman Robert Toll has been prolific in offering keen insight on the general direction of homebuilding in the past. "Research shows that homeownership remains the goal of most Americans," he said during the company's last quarterly conference call three months ago. "And studies are showing that it is now cheaper in most cities to buy a home than to rent." 4. Vera's Calling: Vera Bradley (VRA) was one of the more surprising names to go public last year. Vera Bradley, after all, isn't a scintillating tech stock or a Chinese growth company. Vera Bradley specializes in fashionable handbags and travel accessories. Vera Bradley also stands out because it's one of the few recent debutants that's trading well above its IPO price. Vera Bradley went public 14 months ago at $16, and the stock has gone on to more than double. Analysts see a profit of profit of $0.28 a share when Vera Bradley reports Tuesday, just ahead of the $0.25 a share it rang up a year earlier. 5. Shopping for Shoppers: We're already seeing retailers provide early reads on the holiday shopping season with their store-level sales metrics for the month of November. However, now a few store operators will step up to the earnings stage to reveal their freshest financials. Pacific Sunwear (PSUN), Casey's General Store (CASY), Men's Wearhouse (MW), and Conn's (CONN) are just some of the retailers that will dive into their latest numbers for the fiscal quarter that ended in October. We'll get a good read across various retail specialties. Pacific Sunwear -- or PacSun -- sells beachwear and other sporty outdoor apparel. Men's Wearhouse sells business suits and rents tuxedos. Conn's is a small consumer electronics chain. Casey's won't give anyone a good read on the holiday shopping season, but let's not underestimate the convenience store giant. Someone, somewhere has to be eying the merits of a Beef Jerky Index. Longtime Motley Fool contributor Rick Munarriz does not owns shares in any of the stocks in this article.